Makes no noise, nor do items. Markings :: Brown dorsal stripe with 3 bars on his hip and 1 on shoulder. A leaf like shape on his forehead. Tail :: Lion like tail with locks running off with thicker locks towards the end. He thinks he a looker, and to many he may be. His Spanish lines have given him a broad face, but still sleek head, and a thick neck but not ask bold as a draft’s. His chest is deep and back compact but fitting. His legs are of a warm built but not as delicate looking as others. All in all an athletic creature who is moving into his prime. Covering this skeleton is a rich palomino coat. Taking pride in it he does try to keep it clean, again, he thinks he’s a looker. Got to look sharp for those ladies. Not much mars his coat of gold. One or two scars, but no more than roughing it with loners will cause. On his forehead is a white leaf like shape. It’s very sharp and defined. Most of the time it is missed as it hides behind cream locks. These are rather short and average but as the creature ages, barring incident they will grow longer. He does have a curious feature in the form of a dorsal stripe in rich brown, not far from the color of his eyes. It extends down in the form of one bar on his shoulder and three on his hip. The lad is a Unicorn, and his horns he’ll proud show you. Not a traditional straight horn, these take one the form of an impala. They grow before his ears and curve up over then straight back, and then reach back up towards the end. They are ridged and will not grow much more. He also shows his species through his cloven hooves and lion like tail. The tail has thin cream locks hanging all the way down growing thicker as it goes. This will also continue to grow. He is particularly found of curling it up and whipping it out. Independent. Observant. Bold. Clever. Manipulative. Possessive. Vengeful. Stubborn. Let yourself not be fooled by his golden angel appearance, he’s brute, and a tricky one at that. Devilish, and with a strong streak of mischief he’ll haunt around. And he knows a horse’s mind. Keen observation trained and skilled for a couple of years he will notice. Not that he can read minds, and he does get it wrong at times (much to his inner frustration) but he’s getting better and better. He likes tricks, enjoying a bit of fun, even at the other’s expense. It does not matter to this golden boy if the one receiving these are wounded, his heart was sealed up long ago. Beware if you think you can love this one, you’ll never know when it’s the snake or the heart talking. He’s usually just after what he wants, and alliances mean well, rather little to him. Make it worth wide though and he’ll be a good boy, but otherwise beware of alternate motives. He likes power, likes having a reputation, and over all loves a good laugh. A lover of games and riddles, preferring words to actions. Preferring to twist and mettle than run out and go all blitzkrieg. He’s in control of himself enough to not let his mask fall, but when it comes to it (though admitted it has not very often) he can have a wicked temper. It can drive him to acts he will regret, or will get him in over his head, but feeling his prime coming in and flexing his muscle he says bring it. Sire, Dam, and any possibly siblings that share his blood are unknown on this side of the earth, and the golden is not inclined to speak of them. He was raised across the water and has travelled far to arrive here. In his lands many look as he does. In those lands there was much turmoil, and foals were conditioned to know their place. He, being the son of an advisor to the lord, was raised in the ways of a spy for his kingdom. Quickly he gained a talent for it. The lord was impressed and he was quickly promoted up the ranks, despite his age. When he turned two his battle practice turned more serious and he was delighted to find he was having a growing effect of the ladies. Everything for this golden boy was well…golden. It all came to an end, as all those moment do. Not much is known why he left when he was four. There are rumors of a lady being involved (the king’s daughter no less! ), and a spar which he lost resulting in his banishment. How those lie together is unknown, for there are also rumors of him facing down a full dragon (or griffon) head on head, and leaping a canyon, ridiculous! And yet he does not try to disprove them, enjoying them. He now has crossed beyond those rumors into Helovia. Let Us Play With Fire :: Meets Crash, Arah from the Basin, and Abishia from the Falls and intending to have some fun. Tears away Abishia's mask, but not with the desired effect upon his company. Heads to Aurora Basin with Arah and Crash to officially join. While We Sleep [Welcoming] :: Arrives in the Aurora Basin with Arah, and Crash Course. Things don't exactly go over very smoothly. With the sly alliance of Illynx though, Thranduil accepts membership into the Basin, and takes careful note of his new lady. Turn Around and Talk Slow :: Finds a willing Abishia and intends to make a night of it, but not before making it hotter than hell. He even offers her his attentions in exchange for "the tip of her horn", which Abishia accepts, and as a warning he steals one of her glass feathers. Name :: While haunting the Rotunda, gets disturbed by Gaucho who still is having trouble with his memory. Makes an offer to protect his mind, which is happily accepted, by Gaucho, but arouses suspicion in Mara. So Thranduil puts clothe over Gaucho's head telling him it will make him deaf to lies. Then the fire bird flies off to test it, leaving the golden grinning about his own cunning. Oh, I Just Can't Wait to be Queen :: Comes back from a swim at the Rotunda to find Kahlua haunting the place. She mistakes him as a racist being sent by Illynx, to cover his tracks the golden claims he also is seeking to escape from her. Smooth talking his way through Thranduil seeks sympathy as a fugitive non-racist, and the dirt on his new herd and lady. There is something deeper there though, and the golden slips in a little truth about his philosophy among the mountains of lies which completely passes over the dear damsel. Still, it wins him a free ticket into the Edge any time he wishes, so with that he calls it a success. Direction to Perfection [BASIN HERD MEETING] :: Thranduil returns from the Rotunda to attend a herd meeting. He stays in the back but sees many members there. Earning My Place :: Sees Krierger returning to the Basin bloodied with a blue feathers. Though his size is intimidating, the golden closes in to investigate. It proves to be harder than it looks, but he learns that is from a near innocent lonely Pegasus. Awaken the Fire :: After an effort to build some muscle in the Steppe Thranduil takes a sleep in the snow to cool, only to be rather rudely awaken by a clever little miss, Avarkl. It promises to be a lot of sass and innuendos ahead. Growing frustrated with his continued avoidances, Avarkl leaves, but not before impressing the golden her her ability to spin with him for a few turns. What Suspicion Couldn't Deter :: Is called by his lady, Illynx, and lets her choose a story from his travels in the south to tell. She chooses to know more of Gaucho, and as they talk, she offers him a places as Basin Phantom, which is accepted. Silently grumbling over the fact of having superiors again, the gold is immediately given the task of exploring the Throat. Everybody Wants to Rule the World :: Visits the Threshold in hopes of finding a victim to throw into the Basin and boost in reputation. He discovers a black unicorn, and finds it a good time to play a game or two. ACHTUNG!!! :: Wolves invade the Basin and the golden son enjoys the show of his new family getting caught off guard. Fortunately for them the wolves were easy to repel and Karma decided to teach the golden a lesson. Thranduil is attacked from behind, one wolf grabs his hind while the other slips past. Enraged Thranduil takes down both, but not without a shallow scratch on his shoulder. 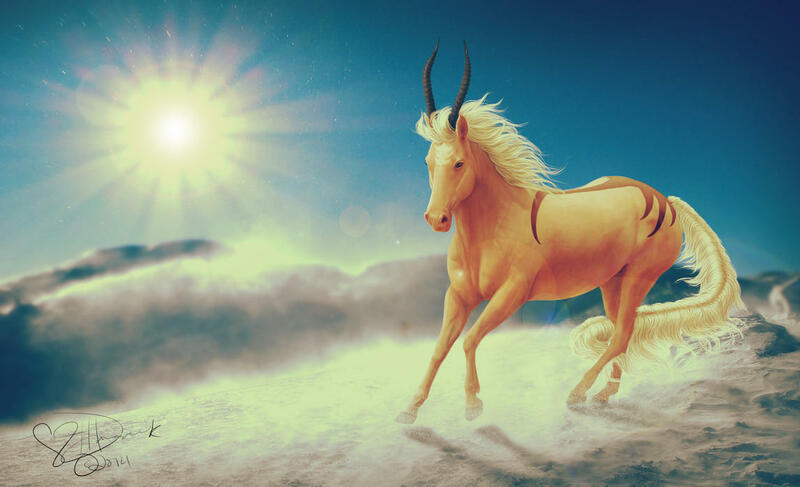 Heroes and Monsters :: Restless the golden moves out onto the Steppe again hoping for some peace. When he finds two mares there in the dark he decides perhaps the rest he needs is found in a change of pace. Time to Up the Medication :: After finding his hock is not healing well Thranduil seeks more revenge on the wolves who attacked the Basin and takes two of their hides. Salvation is at his door though with the arrival of Lena, and the two continue a suspicious (to each other) conversation as the gold washes out his hides. They part with still strong suspicions about each other. Cat Has Got Your Tongue:: After finishing dealing with his wolf pelts the golden son goes to investigate a curious new member of the Basin, Saffron, the tigress. He's joined by Illynx, Rikyn, and a very pregnant Sialia, and takes some sarcastic humor at the question of the father. I Can Be Your Good Time :: As he leaves to start searching for a way into the Throat Thranduil discovers Arvakl at the opening of the arch and decides to try and play a little trick. When Arvakl discovers him the gold can't help but continue the fun. Edge Lunar Eclipse Party :: Discovers the floating isle and sneeks up on the gathering party. Witness the drama surrounding Aurelia. Is about to join the party when Illynx arrives, so instead he sneaks off and gives his own private ode to the Goddess of the Moon on High. The End Will Come Soon :: After the eclipse the gold searches out Aurelia to try and play his way into the Throat. It is a failed effort though, as Aurelia becomes too distracted by Destrier. They'll All Burn Out One Day :: On his Birthday a massive storm rolls through Helovia, causing the golden to relive bitter memories. The damsel queen, Kahlua, also struggling with her own heart, seeks him out for advice. It all goes wrong though when Kahlua questions why Thranduil was out in the rain, and the golden looses it, running out on her. Back to the Black :: Trying his luck again the Threshold, the gold man finds D'Artagnan, a fellow Basiner, already trying to convince the wolf like creature of Vale to join their ranks. Thranduil joins in and is successful in convincing the black to join the herd. 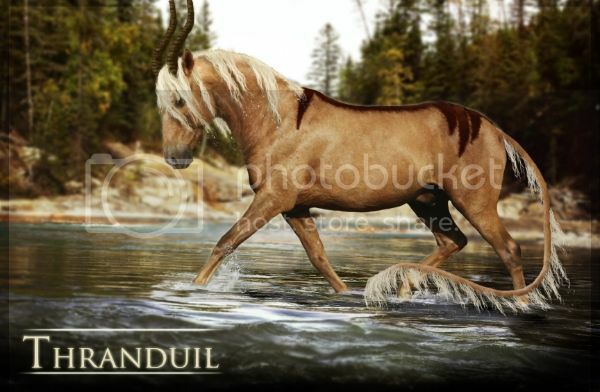 Stronghold :: Thranduil brings the new black stallion into the Basin and his met by his lady. All is going according to plan until a stampede of desperate escaping animals tears through the Basin. Gonna Raise Some Hell :: Once again looking to the Threshold, this time hoping to be taken home himself by the Throat, the gold instead finds a curious fellow Basin mare, Beloved. Curious about just how twisted this mare was, he aids her in trying to recruit a weary, but snarky stallion Panzram, to which they were successful, but the gold leaves the twisted mare to take him to the Basin. Seeing Red Again :: Comes across Krieger hanging around the arch and hides behind some boulders to watch the show developing. From his hiding place the gold sees Oxy attack Krieger, and the curious actions of Elsa, Kiera, and Rei. He learns of Krieger's children's lineage, as well as Oxy and Elsa's relationship. Legacies Always Get in Right? :: After seeing Krieger's death the gold waits about the Arch for his foals to find his body then follows them in. He cruelly tells his Lady and Erebos who has met them, what he knew of Krieger's death, and is harshly rebutted by his Lady and the foals. Worse, he sees one foal, Zunden, holds the feather he desires and doesn't look to give it up easily. Sing Me a Lullaby of Lies :: After an eventful morning at the Rotunda with the God of Earth the golden looks for respite in a grove of willows by a pond only to find Agrona, and the swimming foal, Faeanne, who he joins. The group gets tense, and the gold is left along for another night. Morning's Pretty Trinkets :: The gold revels in the autumn morning, taking off for a morning run. I look inside myself and see my heart is black :: In searching once again for more unicorns to join the Basin, Thranduil stumbles upon Drom (name unknown) and Morir. It didn't go very well to say the least, and revenge is owed to the golden son. Golden Sun Sets :: After loosing to Morir, the golden stumbles into the deep forest, where he finds another Throat member, Andromeda. At his begging she heals him, and agrees to take him to the Throat, against some rising suspicions. Heat of the Sun [Welcoming] :: With Andromeda's help the gold makes it to the Throat, and awaits to be welcomed into its borders. When no one shows, the gold promises Andromeda he will wait, but after she leaves he slips in. If anyone questions him, he decides, he'll claim acceptance, besides that's such a small matter, right? Resentment Grows :: (Liquid time to place between healing and staying in the Throat) Returning to the sky island the gold discovers the weary and beat up figure of Morir, and intends to try and get even. However, the attempt to steal the devil's elk helmet fails, and the gold leaves even more angered with the brute than before. And So I Pray:: (Liquid timing in the liquid time. XD ) Leaving the sky island once again, the golden son finds a small little fire bird. Curious as to the new found boldness of the little one he questions her, and finds her to know of her father, which the gold suspects is God of the Sun. Saying no more though, and settling back to rethink his plans for the girl, the gold leaves her. Meet Your Match:: After the golden settles back into the Basin for the festival in the coming days he meets his boss man, Roland, and is determined to test him. The two agree to a riddle game to test themselves at the festival. Old Dogs and New Trickery :: Thranduil and Roland take their places at the festival to host a riddle game. Roland however, takes the game, but the golden far from anger, is only humored, and slips away to dance with his lady. I Wanna Put on My Boogie Shoes :: After the riddle game the golden see his lady in the tent dancing among some others, and seeking still to gain her favor, joins her. The moment though is cruelly interrupted when a dying stag breaks into the scene with a decapitated wolf head still biting away at its ankle. Lady Moon so High :: Frustrated at being recognized more, the golden sets out to the floating isle at night to try and call upon the Goddess of the Moon to help him solve that small problem. She agrees to help him if only he will fill three moon amulets with powers. But before the can depart a metal tree ruptures the earth and the goddess fashions for this golden man (who's charms are growing on her), an armor his desires. Make Up the Moves as I Go:: Finds a lovely girl cold and alone in the Threshold, but when joined my two members of the Edge, even his trick of unfreezing a tree does not persuade her to join the Basin. The Sun's Winter :: After lurking for so long in the Throat the gold thinks it finally safe enough to become a more visible presence and attends a herd meeting. Though he finds much has changed, and specifically Gaucho's taking lead worries him greatly. Maybe I'll Be Sane For You :: Recovering from his spar with Oxy at his cave in the Basin at the beginning of winter the Golden is headed out when he sees a familiar figure at the entrance, Aurelia. Curious what the drama queen is doing on their door step the gold investigates, only to find she claims her name to be Arete, looking, she says, for Mauja. Unfamiliar with the name as he is the gold angers when Deodat acts brashly, and leaves Deimos with what he knows on the drama bird, winning him a nod of approval from the Reaper, a small victory in getting that black devil back on his side. PESKY:: As the gold walks through the Secret Grove he smells a wonderful scent coming from fruit tree. Stealing away a golden fruit he waits at the shore to see what happens to the others. To his horror the tree begins to bleed and the fruit turns to horse body parts. In panic the gold doesn't notice the flies beginning to swarm, and dashes away without eating the fruit. In Heap Big Trouble :: The dark events of recent, and the cold cause the golden to travel to the Basin again to speak with Illynx and grab his wolf hides. But as he travels north he begins to hear flies buzzing about him, but can see none. He panics realizing it must come from the fruit, and worse Illynx is no where to be seen, so the gold calls for Deimos. The two discuss current events and as a reward Thranduil is promoted to Theif, and receives a coveted bro nod from Deimos. Dainty Dash :: Preparing to leave for warmer places the golden spots the pale mare Aurelia running to escape. Racing down to the Arch he, along with Ulrik head her off, irritated that Deodat failed at his job, but it is not enough to stop the bird from escaping. Let's Sacrifice Virgins :: Headed back south, but still hearing flies the gold spots Arah. The two have a little more than a heated discussion. Murder in Helovia:: Clue Two :: Keeping south to avoid the sure to be blizzard like plains the gold stumbles upon a murdered mare. He also continues to suffer and hear flies, but also begins to feel like the invisible devils are biting him, and blisters are beginning to grow on his lips, roof of his mouth and inside his hooves. Worried about his own future the gold decides to make some allies. Hungry for Some Unrest :: After finding another dead mare on the floating isle the gold joins those who he seeks to ally with, Deimos, and is joined by D'Artagnan and Zikar-Sin. Still fly bites and buzzing plagues him. The group begins to try and piece the puzzle together. Gobbler Wars [COMPANION DROP] :: As his sickness gets worse the gold seeks comfort in the warmths of the caves. He finds no peace there though as turkey broods, ready to cook an egg. Captured once more by the call the gold cooks for her a fabulous meal against Erebos, and wins the orb. Not realizing it will hatch, he slips away with it. Quiet Like A Fight :: Suffering under the full extent of the fly sickness the gold lays miserably in his cave. He sees below a gathering and sneaking out discovers Ophelia’s ascension to power, and learns what they know of Illynx. To weak to join them though he stumbles back to his cave and collapses. We’ll Be Counting Stars :: On the first day of spring the gold awakes to find his illness gone, but the orb which he regards as his precious begins to crack (and hatch) much to his horror. Ophelia makes rounds though and convinces the golden not to kill the creature. Empty Halls Lead to Empty Rooms :: Escaping the needs of the fawn the gold discovers Fable hanging around the Basin’s border and is joined by as sassy Rhiannon much to his annoyance. Fable requests to train under the Basin, to which the golden agrees. It’s Time to Go… :: The gold is forced to make his morning rounds with the small fawn when he spots a curious mare crossing to the Arch. Stopping her, she introduces herself as Malificent, and a visitor by the grace of Ophelia. 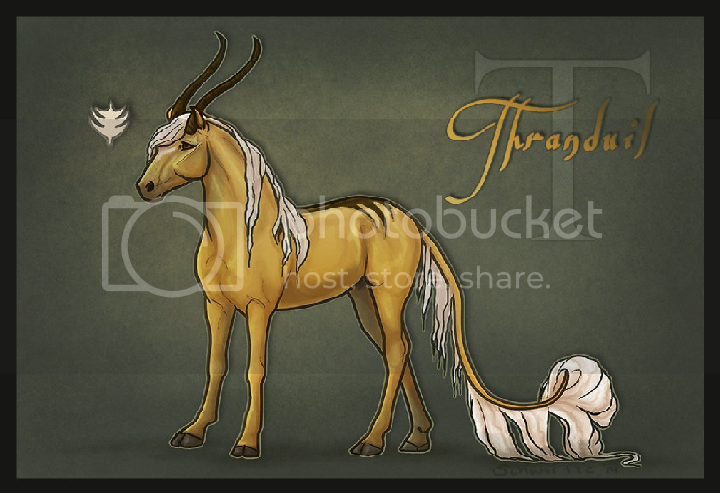 Haldir especially enjoys this new creature and shows off and dances about with happiness, much to gold’s annoyance. Still the gold shows the gray mare around, journeying to the hot springs before she leaves. Awakening :: Haldir can not stand to stay in the gold’s cave and leaps out for an adventure. He finds Aithniel for a playmate and the two enjoy a quick game. Reap What You Sow :: The gold, trying to get away from the fawn in his cave ventures south into the Threshold where he discovers Siska. The creature in the end though decides to journey in Helovia as an outcast and the gold moves on. Will You Kill What’s Left of Me? :: Again journeying south to escape the black spotted fawn, but its distracted of course by crying. He finds Maitimo and tries to console him back to the Basin, but at the arrival of Torleik the new stallions runs off. 007 You Are Not… :: After the scared Maitimo runs off Torleik decides the conversation is not over. Hit Me Again Bartender :: Seeking some peace from the craziness in the Threshold the gold finds shelter in an old favorite, the Rotunda. A lovely distraction of a pregnant Arvakl joins him. Runaways:: Haldir can stand no longer to be left in the cave and ventures out to see his favorite thing, the stars, but it seems he’s not the only creature about. Saffron, thinking this a midnight snack jumps on the fawn, but he is rescued just in time by the golden. The Drums:: After his challenge with Thor over Cetan the golden is jumped by Confutatis, but Ophelia blocks her stealth. Thranduil is still to worn from his challenge, but Deimos agrees, to teach the dark mare a lesson for him. Owed Favors :: Seeing a curious gathering the gold journeys down and slips invisibly into the crowd. He learns about Gaucho taking Hotaru and intends to follow them, but remembering the fawn in the cave he’s forced to turn back. Terminal Point of Addiction :: Trying out his rank magic the gold journeys to the Throat to follow Hotaru and Gaucho. He finds her with Bucephalus, and listens in, learning of the Throat’s plan to blow their land bridge. Mucho Macho :: Trying once more to abandon the annoying fawn the gold in the Throat goes to graze, only to be discovered by Satanic Silk who has a few questions for him. Canon :: The gold moves to attend a herd meeting but at seeing Gaucho, who would recognize him, so close, he slips into invisibility. He hears about Hotaru and sees the Throat is not as happy a family as they seem. Murder in Helovia: Clue VII:: Not trusting Hotaru, the Basin’s pink spy the golden followed her. He finds her and another dead body. Cracking Ice :: Realizing the fawn could not be abandoned the gold begins to teach him about the world in his old language. He is interrupted by Gaucho, who finally spots him in the Throat and descends down the pair with rage at finding him there. Though there seems to be a chance the gold can worm his way out a violent encounter, it seems his time in the Throat is over. I’ve Got My Eye On You :: After Gaucho sends the golden away he travels north, hoping to wash away the strain with the waves. Haldir is ecstatic, but just in time to watch the display comes Deimos. The gold delivers to him the news to him, and receives word to try and investigate another herd, with a few more Falls. Chemical Reaction :: Coming back to the Arch from his time on the beach the gold sees a figure waiting for him. Hotaru does owe him thanks for a recent stealth block, but the pair quickly return to their normal relationships of cockiness and teases. Murder In Helovia: Clue VIII :: In a visit to the sky island the golden comes across another dead body. He hangs about in the shadows as they burn it, and gets a quick snap from Hotaru. He notices a small group gathering around Gaucho and goes to investigate. Murder Clue Eight: Continuation :: After Gaucho shows up a small group gathers to accuse him, thinking the murders done by him. The golden joins in, but invisible, leaning in to listen. Loving the tensity, but his invisibility, he has a bit of fun, and whispers cruel things into Torleik’s ear. It produces nothing, and Gaucho’s mind is blocked, so the adventure was for not. His Valiant Return :: Taking Haldir up to see the floating isle the gold stumbles upon the giving turtle and his holiday tree. Haldir leads the way and the gold follows, and is graciously given a gift. Pick Your Poison [QUEST TURN IN] :: The gold returns to call down the Goddess of the Moon, ready to turn in his quest. She arrives and grants it, and a glowing golden cloak to him for his efforts. Murder in Helovia: Conclusion:: In the shocking finale of the murder plot the golden witness the Gods pull the Moon Goddess from Gaucho, and banish her for her manipulations. He is torn though whether to follow her or deny her for the spilt blood. Balance for the Blind :: After the reveal of the Moon Goddess as the murder the golden feels uneasy, but also desires to see the one who is so much like he. So he finds her at the Rotunda, and speaks with her, but he is not the only one. The gold leaves without much said, and passes on. Mirror, Mirror in the Sky:: In trying and failing to use his new magic to fly the golden is ambushed by a very bewildered Ampere (who’s identity he was using). After calming down though she gets the idea for another purpose for it, and offers to teach him to fly if he will let her borrow him in her justice missions for WHATCH, to which the golden agrees. The blue mare upholds her end of the bargain, and the golden flies off. A Liar’s Detox :: In a strange move the golden takes a wolf cape and heads to the Edge. There he finds Kahlua, and gives her the gift, receiving a glowing rock in return. He can not stand lying to the Damsel any more, because she is so innocent and trusting. So he tells her the truth, much to her horror. Dancing Until Dawn:: Coming back from the Veins with his new magic the golden swings by the Threshold. There he finds a cute little mare, and along with Cashmere they invite her to their homes. The Basin intrigues her, and she joins him heading north. He must leave her outside the Arch though, still she finds her way in. Shipping: Intro:: The Earth God has decided to cleanse the earth and builds a boat for his people to survive it. He requires they help in teams, and the golden, in a mild humor chooses Deimos. Like Ships in the Night:: Deimos and Thranduil head out to complete the first task of warning everyone about the coming flood. Please Listen:: The golden continues to warn everyone to get on the ship for task one. We Must Gather :: Thranduil continues to warn others of the coming flood for the first task, having a bit of fun at poor Fig’s expense. BOAT BOAT BOAT:: The gold continues to complete the first task of warning everyone. Competition is Fierce :: The golden continues to warn everyone to complete the first task. Ice Ice Baby:: The golden journeys with Deimos to the Arch to collect ice/water for the second task, and runs into a few rude characters and some sass. Living Wasteland:: Deimos leads Thranduil to pick plants for the third task. Catch a Tiger by His Toe:: The gold and Deimos journey to the Dark Forest to collect animals for the fourth task. Never one to make it easy, he decides to collect and alligator. The Sticky That Holds It:: For the fifth task Thranduil and Deimos head to collect sticks and sap to repair the boat. Godless:: When Deimos returns victorious over Confutatis the gold visits him to congratulate him on his armor. Feeding the Wolves [BASIN HERD MEETING]:: The gold checks in to a herd meeting, learning of the Throat-Basin alliance, the blowing of the land bridge, and the access being a key. Freedom Now [LIGHT/FIRE DROP]:: With a magic orb sinking into the ocean the golden attempts to retrieve it, but to no success. Let’s Get Serious:: Having found several items in a harpy nest the gold takes a large polearm and his armor to Ulrik. The Engineer not only allows for collapsing of the pole, but adds spikes to the golden’s armor’s collar. Can’t Touch This :: A visitor to the Basin gets the cold shoulder, and nearly some action, but much to the gold’s disappointment Cashmere moves on. Gifts of the Night and Sea:: On a trip out to the beach Haldir drags the golden into saving a nesting sea turtle. Grateful, the turtle noses the gold and a gift is bestowed. Both his shapeshifting and passive magic she gave. Joyous the gold runs to the waves with Haldir, only to be found by Roland. Forcing himself to go back to his business as usual self, the gold suffers through chit-chat with him. From Across the Shadows:: At last the golden gets a chance to try out his new form which he names Rohan. Gliding from the Steppe he lands in the Threshold feigning the need to join the Falls. No More PMS [Welcoming]:: Rostislav takes Rohan to Falls to introduce him, where the bay meets Midas and his family. Surprise, Surprise! :: Seeing a gathering the gold leaves his cave to slip invisibly near. He overhears the Throat has captured Confutatis. Keeping it Calm:: In mindless wandering the golden happens onto a newcomer in the Threshold. After a few misunderstood words, Rexanna agrees to join the Basin. Watch Words::The golden brings Rexanna into the Basin to join, and meet Deimos. Evil is Created, Not Born:: After Hotaru captures Midas, the golden visits him with food and water, but is interrupted by Arah. The Morning Before and After:: One the eve before Orangemoon the gold is caught up in the last thunderstorm of summer, and it finds him as always trapped in his memories. This time though, to pull him through is little Haldir. After a touching moment the golden shifts to the form of Midas and heads down to the valley for the Invasion of the Falls. Blood Colored Sky:: At sunset the golden, disguised as Midas joins the head of the invasion with Archibald and Kahlua. When the large draft sounds out the attack begins. [INVS] Thranduil vs. Open:: After charging before Kahlua the golden finds himself in the middle of the fray and charges through, now caught up in the madness of battle. I Don’t Know How Right Should Feel:: Dragging himself north the worn gold stumbles upon the cart bearing the dead Midas, and in his tired state it unsettles him all the more. Greetings and Threats:: Coming back to the Basin after the invasion the golden is ready for a rest, but finds one more issue awaiting him at the door. Gaucho is demanding to speak with Arah, and the gold, in a no funny business mood, reveals himself. Gaucho though angered to see Thranduil, states his beef is with Arah's prisoner, Diesel. After a warning is given to him, the Wildfire departs. A Little Distraction:: Cheveyo's Sun Amulet :: Pass :: Due to Alliance Cheveyo keeps it. 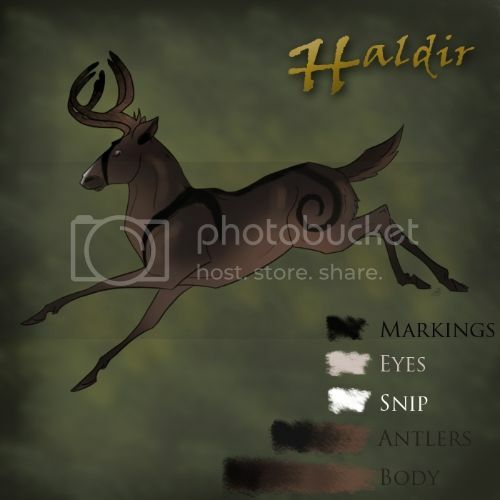 Common Cerndyr :: Dark Mist A small deer, standing at about three and half feet high, and weighing around 100lbs. He is dark coated, with a lighter underside. Black bars run down his face, shoulders and back, while they swirl in a spiral on his hips. Face is mostly dark but with a small white snip, and white, pupil less eyes. Antlers are 16 tined and darken at the tips. Haldir is light hearted compared to his bonded. He believes there is always good in everyone if we are only bold and courageous enough to see it. The deer knows little fear, having dealt very little with pain and death, and so is very bold both in action and voice, often seen chiding the golden. Haldir is also a quick learner, and sharp. His keen eyes can spot creature before the gold, and he knows both Helovian, and Elvish. The deer, as he ages, has developed a calmer sense, but still has a sense of humor, and childishly good heart. The dark deer holds the power of Dark Mist. When desiring to, or when his mind creates the need, a black mist, which usually just trails his hooves, grows and swirls actively out. Those who inhale it will feel a clouding of thoughts or emotions. Born on the first day of birdsong in Year 5 Haldir was full of life from the start. Though pushed away by Thranduil at first, the small fawn hasn't seemed to mind a bit. He continues to desire to follow the gold and be just like him. It took a while for Thranduil to warm up to the idea (he tried to abandon the thing multiple times), but since then the two seem to coast along. The gold teaches his bonded his old tongue of elvish, and lets the thing travel along more. Haldir proved nothing like his bonded. The little black spotted fawn was full of life. He loved to play, and explore. New creatures were a fascination and excitement. He would not be left behind much longer, and developed a strong determination in the days of trekking endlessly across the land. He loves it when it proves valuable. Especially when he finds a way to be useful. Oh to feel needed is a most precious moment for him. It shows his ability to be unusually kind and gentle, which is so different from his bonded. The fawn also seems to have the ways of his ancestors. He is a proud creature, able to hold his head high with the best of them. The gold especially seems to enjoy this. One of the most curious features though is something the gold chalks up to his brilliant parenting, the fawn has no fear, or sense of danger. Though a recent run in with a tigress has taught him caution, there is little that he fears, and so ever step is bold. Much has happened in the last season and this which has changed the small fawn into deer. He has shed his dark spots, and his adult coat has grown in. Its dark swirl pattern accented only by the white snip on his nose. Dark eyes fade, to their adult pale pupil-less color, much to the golden's shock. He at first thought the deer was going blind, but found the deer's senses were growing even stronger than his. Still possessing that deep curiosity of the world he sees it with fresher eyes and ears than his bonded, and so many times will hear or see others before even the trained golden. Overall he is growing closer to his full height, though he still misses the horns upon his head, they are sure to come in soon. Though Haldir still does not know the full grief and weight of death, he has learned caution. Of course, he also has learned not to let it hinder him. The deer is still incredibly bold, and brave. This now though shifts from the child-like innocence, to the regality of his ancestors. Also, following their characteristics the deer has become incredible bold to his bonded. He has learned most of the gold's elvish phrases, proving he is a wicked fast learner. Though the two still have not spoken through their bond, the deer is sure to get his point across. Like no other he is able to make demands on the golden, and multiple times has won the argument, much to his satisfaction. Though the gold, when in long company with the deer is lightened in mood by their bond, Haldir seems to brush off the gold's moods. He instead remains most sincerely good hearted, and kind. In that effort he has also begun to display his magic, and at his will dark mists rise from his hooves, and the moods of those who inhale even a hint of it are dampened to his desire. This is still very little controlled though. ::[ Magic: Dark (U) | Can mimic another character’s magic. Same restrictions. PM or Skype in your questions. They can be absolutely anything (besides stealth answers), and he must answer them honestly. What was the first thing you ever stole? The golden twiddles his glorious locks. “Well if I’m in a hurry I just get Haldir to brush them down for me. But really my favorite thing is to head over to the steam pools in the basin. Now I know you’re thinking, frizz, Thranduil, frizz, BUT the moisture is so thick it allows them to become soft and straight. Course not every land has its own steam pools, so I usually have to make do with a stream. It takes a while granted, but if you have a cerndyr it speeds the process up so much. What you don’t have a cerndyr?! Here take mine.” The gold drops the fawn and dashes away. The golden sits chained, tortured, and beaten, but finally answers. "Kahlua." The gold smiles with a tragic face. Shifting uncomfortably he sighes deeply. His voice comes across rough, “Yes….” And then he slowly leaves to cry himself to sleep. The gold gets a hungry look in his eyes. "Waffles! I like to hide syrup in the pockets"